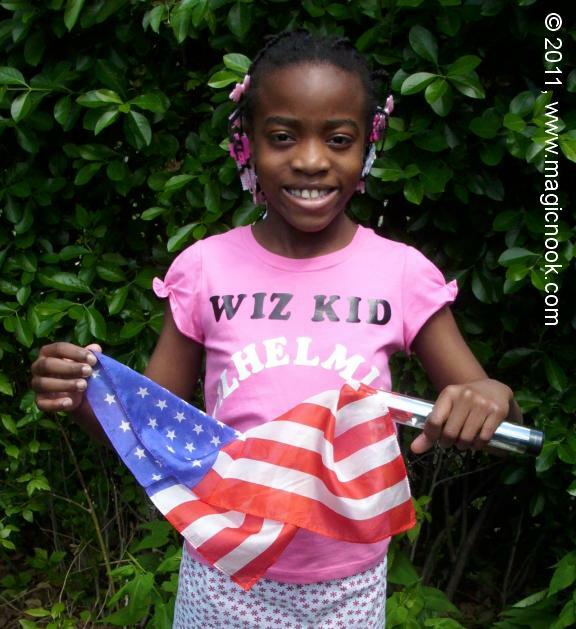 You may be of the opinion that the world does not need another Mismade Flag Trick, but you haven't yet seen Wiz Kid Wilhelmina's original twists put to the old effect. For one thing, she does not use a change bag ... that would be too easy. She doesn't use a dye tube you have ever seen before, either. Instead, she rolls up a piece of clear cellophane about the size of a number 10 envelope... yes, you can see right through it at all times... and time after time makes the silks transform from one flag to the next without giving you a clue as to how it is done. She doesn't "accidentally" drop the blue silk on the floor, either. Instead she empowers a little helper to hilariously "kidnap" the blue silk again and again without even knowing how he is doing it. Professionals will USE this; all others need not apply. "I wanted to do some magic with an American Flag for my Cheerleader Group at school. Grandpa Spellbinder gave me some old American Flags he had in a basket, and told me about the magic trick known as the Mis-made Flag. "In the beginning * , the Mis-made Flag was treated as a dye tube effect. Then magicians got lazy and discovered they could do it more easily with a change bag. The poor old change bag has been used for just about everything. I got one in a magic kit when I was younger and wondered why anyone would attach a bag to a ping-pong paddle. "Grandpa Spellbinder listened to my complaints and told me that if I didn't like any of the ways currently used for the trick I should work out my own way of doing the trick, so I did. He gave me some books to read, and I read some ideas from old timers, like Vernon Cook, Sydney Legrande, Hank Moorehouse and Ken De Courcy, and then I got to work." To see the results of her work and see how a nine-year old can breathe new life into a very old magic trick... get this e-Book! * The Mismade Flag has been credited to Carl S. Lohrey of Dayton, Ohio, who invented the idea prior to its publication by P. B. DesRochers in Thayer's Magic Bulletin Vol. 3, No. 1, January, 1915.